Would you want an Emoji Keychain? You are at the right place. 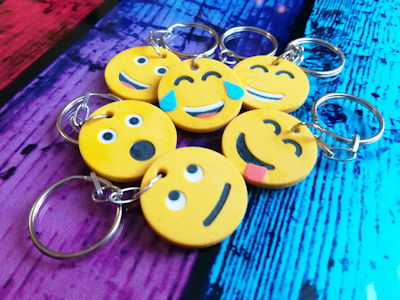 Order more emoji keyrings, so you can always keep up with your mood - whether you're crying, laughing, smiling, surprised or thinking. But with us you can make your own unique emoji keyring too. We have created a 3D emoji model for you to customize your keyring and order what you make for yourself (digital DIY). In this case, you will have more opportunities to make a mood for your favourite emojis that you just want. You can adjust its size and colour if you want. The model is available here: Custom Emoji Keychain (DIY). This feature works only from a tablet or desktop computer. Write us if you would like an other one! Order from our existing Emoji Keychains below. Pile of Poo Emoji Keychain created by 3d printer. An Emoji keyring will always give you a good mood, since you can always keep keychains at yourself so it's not only available on your phone virtually. Smiling Face With Sunglasses Emoji Keychain - 3d printed product. An Emoji keyring will always give you a good mood, since you can always keep keychains at yourself so it's not only available on your phone virtually. Emoji keyring - if you would say it without words! A single yellow head can express joy, happiness, sadness... But if you've already made one with an emoji creator or you want to see your insta profile we will make it for you. Choose the right one or create your own, wear it or give it as a gift! Custom 3d printed emoji keychains (smiling, grinning, beaming, thinking, face with tears, poop, etc). Nowdays a modern keychain is not only a practical way to keep keys together but a trendy and fashion accessory. These style of emoji key rings can show your emotion. It could be really amazing and lovely suprise for anybody who likes emojis.